It's an endurance horse race, testing riders to the their physical and mental ability to complete 1,000 kms in eight days. She'll have 8 horses to get acquainted with and ride each day. The ride begins October 1. USA's Devan Horn, a Mongol Derby veteran (2nd in 2013, withdrew in 2015), is thrilled to begin this new escapade in South Africa. "It feels incredibly right to be headed into another wild, insane adventure," she wrote. "I'm indulging a measure of wild ferocity I generally attempt to batten down in polite company. In three weeks’ time, I’ll have both of the longest horse races on the face of this planet dusted~!" She got a chance to ride two of her horses on Wednesday. "I'm quite happy with both of them, and I still have 6 to meet!" Her hotel is a great accommodation with roan antelope and sable antelope out by the pool. "I don't know how I ended up in this African palace, but I'm not asking any questions! I keep expecting someone to come in and tell me I've got a cot in the back of the horse trailer instead. But it seems to me this cozy little room (with ensuite SHOWER!) is mine for the week! I'm in such good hands with these excellent horses and hostesses!" It is with deepest regret that we confirm that there was a rider fatality on Saturday, 24 September 2016 at the CEI 2* 120km at Llay Llay, in the Valparaíso region of Chile. Hugo Valdés Barros (CHI), 58, fell from his home-bred, 10-year-old gelding MP Sifax on the second loop. There were no witnesses to the incident, but it is thought that the rider fell after his horse failed to make a turn on the track and jumped a small canal. The horse was uninjured in the incident. The Organising Committee cancelled the rest of the day’s events and a full police investigation has been launched to look into the circumstances of the accident. Hugo Valdés Barros, who lived just outside Chile’s capital Santiago, had worked with horses all his life. He had competed in Endurance events at national level in Chile for more than a decade and internationally for the past two seasons. This was his second CEI 2* with MP Sifax, having finished 12th at their last outing on 14 May in Matetic (CHI). He leaves behind his wife Maria Pía, daughter María Elisa and two sons, Cristián and Ignacio. “As the President of the Ground Jury at Llay Llay, I would like to extend our deepest sympathy and condolences to the family and friends of Hugo Valdés Barros and to the whole Endurance family,” FEI Official Elizabeth Huyghe said. A funeral mass was held at the Church of Santa Elena in Santiago on 26 September, and a memorial service for Hugo’s fellow riders and friends will be held at the Cementerio Parque del Recuerdo on Saturday 1 October at 17.00. AERC President Michael Campbell, and chair of AERC's International Committee Dr Meg Sleeper, have written a letter in response to the recent World Endurance Championship in Slovakia. Addressed to USEF's President, Chrystine Tauber, Campbell and Sleeper express their great disappointment at both the outcome of the WEC - a needless equine fatality, and numerous eliminating due to over-riding - and at FEI's appearing to initially "spin" a story about the breakdown, instead of stating what happened. AERC "is very concerned about ongoing abuses in international endurance riding" and requests several recommendations be forwarded to FEI, including designing championship courses with technical variations, instead of flat for speed only; continued stringent drug testing, including sensitivity tests on horses' legs to detect nerve blocking agents; more emphasis on the goal of "fit to continue"; crewing on trail should be drastically reduced or eliminated all together; significantly increased and serious suspensions for stables, owners, trainers, and riders whose horses have been metabolically compromised from over-riding. While veterinary standards and rules appear to have improved over the past year, events at the 2016 WEC show there is still a long way to go with horse welfare in FEI endurance events. JULIE Woods will become the oldest Victorian to ride in Australia’s toughest endurance horse race next month when she mounts up at the age of 80 for the Tom Quilty Gold Cup. Ms Woods rode her first “100-miler” when she was 50 and if she completes the course successfully on October 8 she will collect her sixth Quilty buckle. AUSTRALIA’S endurance team finished fourth in the teams section of the 2016 World Endurance Championships in Slovakia at the weekend. Oman riders claimed fifth place in the team event at the competitive FEI World Endurance Championships in Samorin, Slovakia on Saturday. Spain’s Jaume Punti Dachs captured individual gold and led his compatriots Alex Luque Moral and Angel Soy Coll to the team title. Moral took the individual silver, with Bahrain’s H H Sheikh Nasser al Khalifa claimed bronze. The Spanish led an all-European team podium, with France bagging silver and the Netherlands holding on for bronze. Hands-up anyone who seriously thought the UAE would be on best/better behaviour at Saturday’s world endurance championship (WEC) ride in Samorin, Slovakia? Having learned nothing whatsoever from the litany of criticism, FEI suspensions and legal agreements, the UAE delivered even worse results than at WEG 2014 and managed to kill their stable star. Not one individual got round by using their trademark burn-out strategy. Yet all were mounted on seasoned troopers, some prepped by their trainer-mentor Juma Punti Dachs, who steamed through to take two WEC golds for his native Spain with Twyst Maison Blanche. The defending champion Sheikh Hamdan went out for lameness at gate 4 having led with Ramaah. Only 47 finished out of a field of 134. The sport should be ashamed by both the 35% completion rate and that the provisional first three were eventually ruled out, two for lameness and one for metabolics. Two were Emiratis, one a Uruguayan, another nation fixated on the racing-style sport. There was some good riding but the overall picture was dire. At Rio, experienced Paralympic dressage rider Philippa Johnson-Dwyer was eliminated for a small spur mark on her horse’s flanks under the blood rules. Philippa lost the use of an arm and has spinal injuries, so any tiny abrasion could possibly have been caused by a totally understandable momentary loss of balance on her part. Yet at a world title endurance ride, for every sympathetic rider you’ll see another that has barely mastered rising trot yet is permitted to crash along for 100 miles hanging on to a mouthful of hardware that would shame the Spanish Inquisition. But then again, large numbers of the public are less likely to watch endurance than an arena sport on TV like dressage: silly me. The UAE also lost Ajayeb, ride of Sheikh Rashid Dalmook al Maktoum. Ajayeb sustained an open fracture of the cannon bone, the sort seen too often in the desert rides. To add to the catastrophe, witnesses tell me that Ajayeb broke free from a makeshift screen made of sheets and tried to run on three legs after her companions whose riders had continued on their way. She had been up with the front-runners in loops 1, 2 and 3. A horse has been put down at the FEI world endurance championships at the weekend (15-18 September). Ajayeb, ridden by UAE rider Sheikh Rashid Dalmook Al Maktoum, tripped and fell on the fourth loop of the 160km track in Samorin, Slovakia. The 15-year-old chestnut mare suffered “an irreparable leg injury” to her off fore and had to be put down. “It was a very tough day”, said Spanish rider Jaume Punti Dachs, who took team and individual gold at the competition. “There were magnificent horses in front of me, but endurance sometimes happens like this. You do everything right and then something goes wrong. It’s like life..."
In a day of weather that changed as often as the ride leaders, Spain’s Jaume Punti Dachs captured individual gold and led his compatriots Alex Luque Moral and Angel Soy Coll to the team title at the Longines FEI World Endurance Championships 2016 in Samorin (SLK). Fellow Spaniard Alex Luque Moral and Calandria, the lovely 10-year-old grey mare that deservedly took the best conditioned horse award, were 50 seconds off the pace to take individual silver, with Bahrain’s HH Sheikh Nasser Bin Al Kalifa taking bronze with Waterlea Dawn Treader in a time of 06:49:47. In fact none of the UAE team recorded a completion score, even though HH Sheikh Hamdan Bin Mohammed Al Maktoum and Ramaah had been at the head of the field throughout, until the 12-year-old gelding went out at the fourth vet gate. Sadly, Ajayeb, the 15-year-old chestnut mare ridden by Sheikh Hamdan’s team mate Sheikh Rashid Dalmook Al Maktoum, tripped and fell on the fourth loop of the track, suffering an irreparable injury to her right front leg and had to be euthanised. A local horse rider, 24-year-old Lanel van Nieuwenhuizen on her mare Jozami Zanica, dominated one of Africa’s toughest endurance races recently. Competing in the African Endurance Championships on 24 August, Lanel came up against top riders from South Africa, Namibia and other countries. Not only did she finish the gruelling 122km in a winning time of 06:34, she clinched the overall first place. This was the 10th time Lanel competed in Walvis Bay, Namibia, but not the first time that she had won this prestigious race. As well as taking third place in her category in 2013, she won the race overall in 2014 and managed a second place in last year’s race, taking the award for the Best Conditioned horse, as well as the Best of Best award. “Walvis Bay is definitely one of my favourite races on the endurance calendar,” said the well-travelled Lanel. She has competed on Zanica, as well as on unfamiliar horses on local shores and abroad. “But Walvis Bay, although tough on both rider and horse, is beautiful. For one part of the race, you find yourself in the desert. The next moment you get to see the flamingos flying over the ocean as you gallop alongside the waters,” said Lanel. Orange endurance rider Ben Hudson says he and his beloved steed Oso Cap Braveheart will relish the experience of representing Australia at next week’s Federation Equestrian International World Endurance Championships, in Slovakia. Hudson, just 23, was named in the five-strong Australian squad after winning his second consecutive Australian Championships at Imbil in July, he clocked just over 10 hours on the little but big-spirited Arabian stallion to do so. Only three seconds separated Hudson and runner-up Kaylea Maher. For the confused, or unfamiliar, endurance riding is exactly as it sounds – riders and their mounts navigate their way around the very long, often gruelling courses in a bid to clock the fastest time they can. Dubai: Shaikh Hamdan Bin Mohammad Bin Rashid Al Maktoum, Crown Prince of Dubai, will be hoping to repeat his landmark 2014 victory as he leads a strong UAE team in the Longines FEI World Endurance Championship in Slovakia today. Shaikh Hamdan, who will start the 160km ride at the state-of-the-art Samorin Equestrian Centre as the huge favourite, produced a breathtaking ride on Yamamah to win the gold in Normandy, France two years ago. In what is often described as one of his best performances, Shaikh Hamdan and Yamamah overcame rain and testing conditions to triumph over a world-class field of 173 riders from 47 nations at the historic venue. x-bionic sphere® hosts World Endurance Championship with the attendance of 45 countries, which is 7 more than total attendance at previous World Championship. After todays Vetc check, total number of 132 horses will start tomorrow from Šamorín facing various types of surfaces and after challenging 160 kilometers, riders will finish the race here at our equestrian Race track. Start is scheduled at 6AM. We are looking forward to greet each rider at the finish line! A record 46 nations (including Canada, represented by Yvette Vinton and Kataki) will contest the Longines FEI World Endurance Championships 2016 this Saturday (17 September), with the world’s top Endurance athletes already on-site at Slovakia’s state-of-the-art Šamorín Equestrian Centre, brain-child of Slovakian businessman Mario Hoffmann. A total of 136 horse/rider combinations will head out on the 160-kilometre track in a 6am mass-start, with five loops of 40, 35, 35, 30 and 20kms running across grass, field and forest tracks alongside the River Danube and skirting around Bratislava at the foot of the Little Carpathians mountain range. The youngest competitor at the Longines FEI World Endurance Championships is 14-year-old Pilar Saravia from Uruguay. Currently ranked number three in the world, she won her first 3* 160km ride on home soil in July, with her second 3* 160km win in Buenos Aires just two weeks later. Dr. Yvette Vinton, who currently resides in Ocala, FL, is set to represent Canada at the Longines FEI World Endurance Championships, taking place Sept. 16-18 in Samorin, SVK. A total of 136 riders are due to compete at the International Equestrian Federation (FEI) World Endurance Championships, which get underway with the Opening Ceremony in Samorin in Slovakia tomorrow. The United Arab Emirates, Bahrain and Qatar are all expected to do well at the event, which remains shrouded in controversy after Dubai was stripped of the hosting rights earlier this year following horse welfare concerns. Uruguay and Spain are also sending strong teams to Samorin, which was confirmed as the replacement for Dubai in June, while Mario Hoffmann of Slovakia will be looking to make full use of home advantage. The FEI have confirmed 46 countries from five countries will be represented at the World Endurance Championships, with the main bulk of the action due to be held on Saturday (September 17). 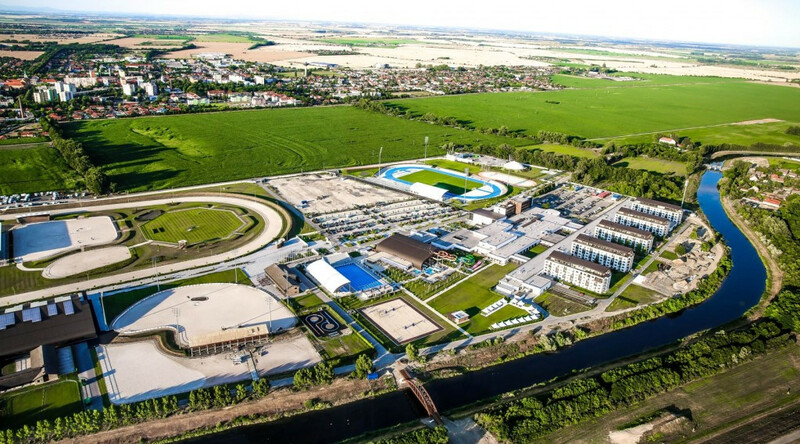 The Samorin Equestrian Centre, the venue for last year’s European Championships, was chosen to stage the event ahead of rival submissions from Fontainebleau in France and Pisa in Italy by the FEI’s Endurance Committee. Both the French and Italian bids were rejected after they proposed mid-October for the Championships, meaning rides would start and finish in the dark. Dubai's axing came after the Emirates Equestrian Federation (EEF) was suspended by the FEI for "major horse welfare issues" in March 2015. USA's Meg Sleeper and Shyrocco Rimbaud, and Tom Hagis and Indian Reinman are in Samorin, Slovakia, finishing last minute conditioning and preparations for the 2016 World Endurance Championship, which will start at 6 AM on Saturday, September 17. Sleeper will be represented by two of her horses at the WEC. She also owns Syrocco Rabia, who will be ridden by Fernando Paiz for Guatemala. Additionally, Colin for Gold, owned by USA's Valerie Kanavy, will be ridding by Hirofumi Ono of Japan. Days are filled with caring for the horses - riding, hand walking, hand grazing, feeding, bandaging, lasering (MR4 ACTIVet cordless, cold laser made by Multi Radiance Medical), and team meetings and meals. Horses moved to a main barn at the venue on Monday. "We are in 'The Hague' barn," said Meg, "which I am hoping will be good luck since Val [Kanavy] won the championship there [in 1994]." Also on Sunday, the horses were able to pre-ride the blue loop (about 12 miles), the last phase of the event. "The trails for endurance are very firm and in fact there are places it is so well packed it looks almost like concrete. We knew concussion was going to be an issue for the horses with this trail, and ours are all padded to try to minimize the concussion," Meg said. Currently the forecast for Saturday is 75 degrees with no rain. Meg discussed the competition aspect of the event. "The scuttlebutt is that the winning speed will be 25kph (or 15.6 mph). That’s a blistering pace over 100 miles, and I don’t doubt there will be people doing it. It is going to be a very interesting event. "To give some more perspective, the awards ceremony is scheduled for 6pm the night of the race (12 hours after the scheduled start time). I have no doubt that there will be those that attempt it and some will be successful. "The speeds that some can and have achieved, and to be honest the abilities of all high level equine athletes, keep me in constant awe of the horse. And I suppose that’s what sport and competition is: to push the limits of our capabilities. "All I am able to say for certain is I will do my absolute best in regards to the competition, but also in regards to trying to keep Rim healthy and happy. "And I can speak for the USA team (and Guatemala and Japan) when I say we will do it clean." 46 countries, 5 continents, 136 riders, 149 horses ! The World Endurance Championship of Samorin promises to be a great event! The best riders are gathered in Slovakia for the highest level of competition that exists in endurance. If Sheikh Hamdan bin Mohamed al Maktoum is considered to be the ultra favorite, other rider can take the supreme title. Which one? This is very hard to say! Unquestionably, UAE, Bahrain and Qatar are to be taken seriously. For the UAE, Sheikh Mohamed bin Rashid al Maktoum arrives with the best M.R.M Stables’ team. The countries of the Gulf have very good horses with beautiful and long career, like Leonardo, Ajayeb, Napoli del Mar and many others. Uruguayan riders are known to be fast, but Spain presents a strong team with its two stars riders, Maria Alvarez Ponton and Jaume Punti Dachs. Other countries have good chances too like France with Jean-Philippe Frances, and Slovakia with Mario Hoffmann, who can be galvanized by running at home. And the coach can change riders and horses until the pre vet check and equestrianism is always a matter of the horse plus rider. All that can be said is that this Championship will offer a very nice show. So let’s meet on next Saturday at the x-bionic® sphere – Samorin ! Definite entries have been announced for the 2016 World Endurance Championship to be held this weekend in Samorin, Slovakia. 136 riders and 149 horses are on the entry list representing 45 countries. Kingwood Township resident Meg Sleeper is headed back to the FEI World Endurance Championships and friends are helping to pay for the trip. In August, the United States Equestrian Federation (USEF) named Sleeper and her horse, Shyrocco Rimbaud, or Rim for short, to the United States team. The championships will be held in Samorin, Slovakia, Sept. 16-17. The Spanish athlete Paula Muntala Sanchez riding 10-year-old part-Arabian Echo Falls emerged victorious after the 120km Meydan FEI European Endurance Championship for Young Riders and Juniors in Portugal, leading the Spanish team to gold as well. Held at the Rio Frio Equestrian Centre, 38 athletes aged between 14 and 21 from 11 countries left in a mass start at 06:30 on Saturday, 3 September. The competition circled in four loops of 40, 30, 30 and 20kms, with gates and veterinary inspection areas on each loop. The young but seasoned, Sanchez, aged 21, completed the ride in 05:14:57 with an average speed of 22.86 kph riding though the heat of the day, which reached 30°C with 40% humidity. The all-female Spanish team came into each vet gate within minutes of each other, pulsed down and left in the same way, and arrived at the finish just after Sanchez, placing 2nd - 5th individually in this order: Laura Fernandez Piña on Cadigaam, Bruna Pujols Aumatell on Lludriga De Masferrer, Raquel Costa Condina on Kalima Casanova and Naroa Calvo Ibáñez on Escarsi. “The plan was to be strong with all the team from the beginning to ensure that at least one of our team members could be in the medals,” said Sanchez after the ride. Echo Falls is by the full Arabian stallion Tango D’Ayres by the legendary Persik out of the Appaloosa mare, Song of Wind. Heading out in the first wave of the mass start, Spain’s Sanchez and her teammates blended like a grey cavalry into the low fog of early morning as they led the way for the first 40km loop. The five athletes took possession of the race from the start, never leaving first position throughout, but knew they were being chased by France’s Henriette D Ursel on Wloszka Fontanel and Emma Frances on Quokin De PSA. João Maria Moura riding Distinto for Portugal kept within five minutes of the first seven riders throughout the course and he was followed by Italy’s Costanza Laliscia on Rok and Camilla Coppini on Veinard Secondo. Great Britain’s hopes were dashed early on as they lost all three riders by vet gate two. Besides host Portugal, athletes represented Belgium, France, Germany, Great Britain, Hungary, Italy, Netherlands, Norway, Sweden and Spain. Seven teams started and five teams completed. A course completion of 57% finished the last rider, Imke Lamsma from The Netherlands riding Sjacour in the ride time of 07:43:12 with an average speed of 15.54 kph. The FEI European Endurance Championship for Young Riders and Juniors is an important foundation for future top Endurance riders. The last edition of this Championship was in 2014 in Verona, Italy. To compete, athletes must have successfully completed at least 3 CEI 2* events or higher. The trails of mostly sandy soil went through ancient cork oak forest, around thriving vineyards and between irrigated rice paddies, allowing for many natural water spots and easy access points for crews. The public could also view the athletes in viewing areas designated along the national roads. This route has been in use and tested since 2014. The Rio Frio Equestrian Centre is located on the southern bank of the Tagus Estuary, 30km from the Portuguese capital of Lisbon. *Also finished: Belgium (finish time 19:57:53) & Netherlands (finish time 20:42:03).